The goals of initial wound care following severe burn injury are to cool the wound, decontaminate and cover the wound quickly, and minimise heat loss. Definitive wound care will be achieved at the appropriate Burn Service. The gold standard for Burn First Aid is 20 minutes of cool running water which is useful for up to 3 hours following injury. More information regarding Burn First Aid can be found here. 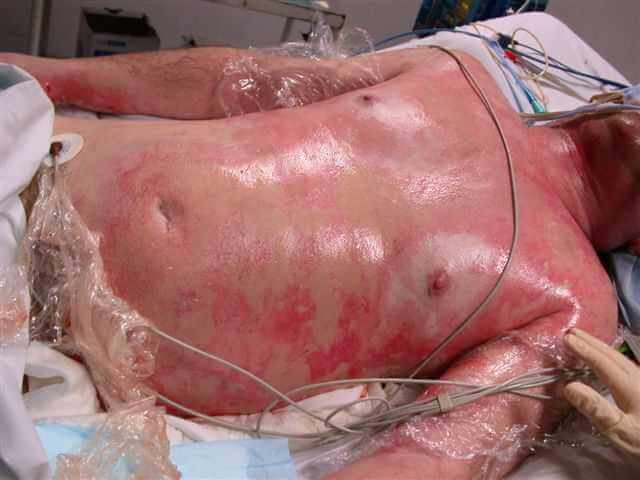 Core body temperature should be monitored when cooling severe burns injuries due to the risk of hypothermia, and cooling should stop if the patient becomes hypothermic. Clean the wounds with Aqueous Chlorhexidine 0.1% solution or Normal Saline. Decontamination should not delay transfer, and consider simply covering the burn wounds if the patient is otherwise ready for transfer. Decontamination and cleaning can be attended to at the Burn Service on arrival. a dressing should be considered. Place the patient on a burn sheet to absorb any exudate and to allow for minimal adhesion. It is important to document if the burns have been contaminated at time of injury or during care eg. if the patient rolled in dirt or jumped into a dam to cool the burns. The risk of potential contamination will inform ongoing Burn Service wound care.